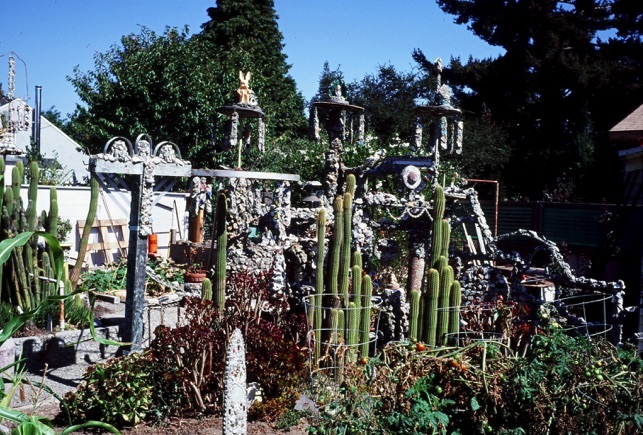 The inspiration for this fantasy garden came about in 1932 through a personal tragedy when the young son of gardener John Guidici drowned in a backyard pond. Despondent and upset Guidici decided to fill in the pond with cement. 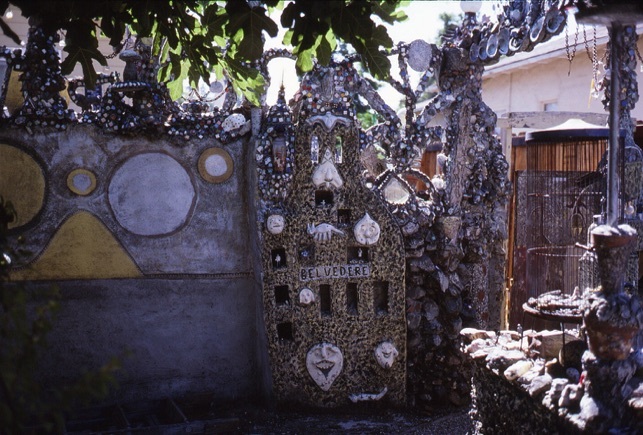 Before the cement had time to set, Guidici began decorating it by pressing rocks, shells and other broken bits of materials that he had at hand to embellish the otherwise bland surface. What started out as a simple project soon evolved into a huge backyard environment that eventually covered the entire property. When I first visited the site in 1985 his daughter related to me how her mother was continually on guard as her father was always taking things from the house to use in his ever-growing environment. Guidici was also never allowed to wash dishes as he had a habit of breaking them and then adding the shards to his creation. 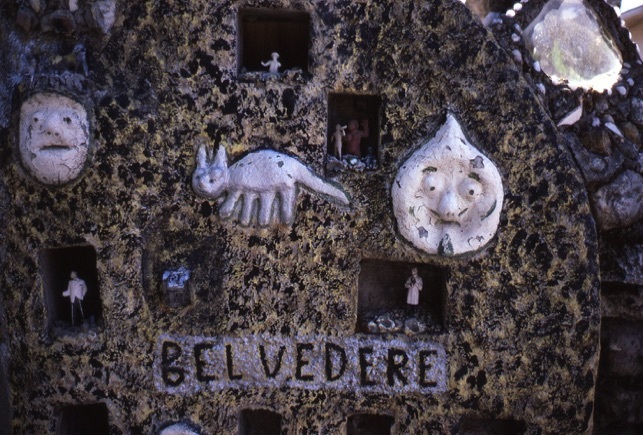 One of my favorite areas was a shrine titled Belvedere (good view).This was a 6-foot high painted cement shrine composed of 12 niches in a cathedral façade format. Seven niches held figures of a bridegroom, an alter boy, a plastic King Kong and toy soldiers. 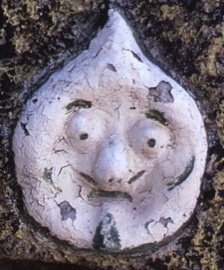 Other surface features included 6 cement bas-relief faces of people and a portrait of Guidici’s cat. 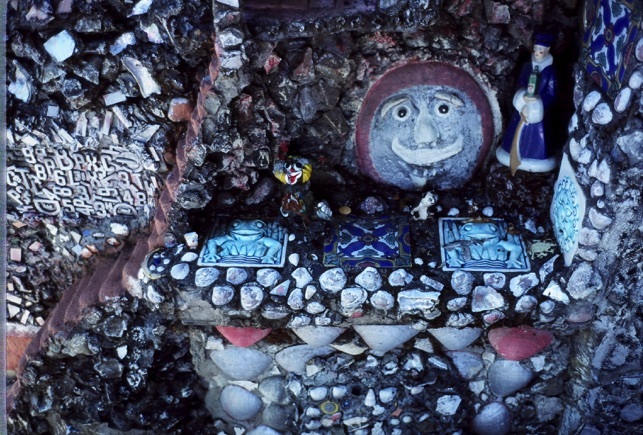 The top of the shrine was covered in small square colored mosaic tiles including a pair of dice each showing 4 spots below a silver King Kong bas-relief. The entire surface was painted in a muted yellow with a black spotted surface technique and a hand lettered Belvedere sign. 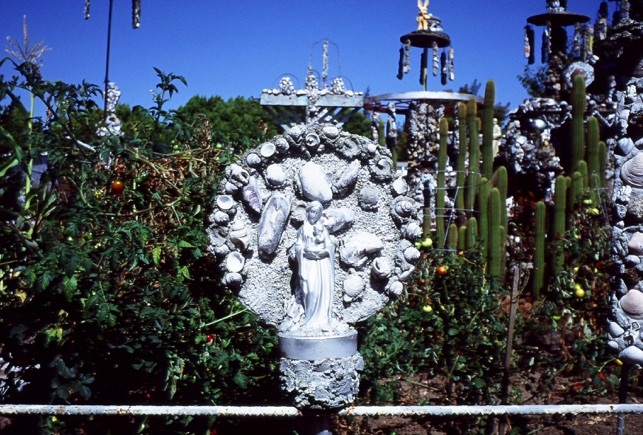 In the profuse vegetable garden were several wind-activated sculptures that discouraged gophers along with a number of handmade cement mushrooms and a flamingo weathervane. Unfortunately like a lot of other highly personal spaces Capidro no longer exists. The once modest College Terrace neighborhood home found itself in the late 1990s in an area were average selling prices were in the million dollar range as property values escalated beyond anyone’s wildest dreams. The dismantling of Capidro was no doubt to the delight of many neighbors who viewed the California Historical Monument as nothing more than an embarrassment and an “ugly” blight on the land. Too bad because it was the only home in the area that had any personality. 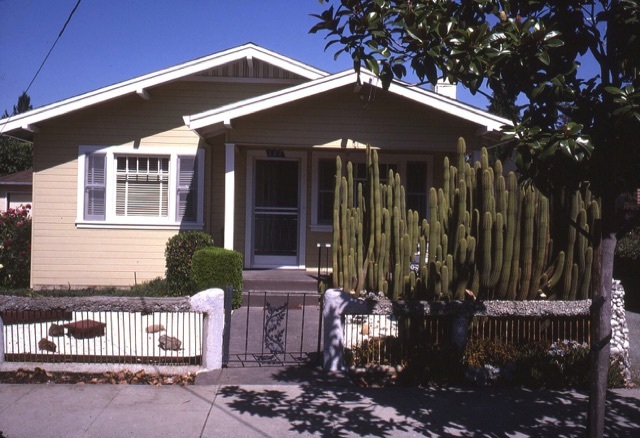 The modest tract house on a nondescript street in Palo Alto, California was the most visible building on the block at one time, much to the dislike of many neighbors. 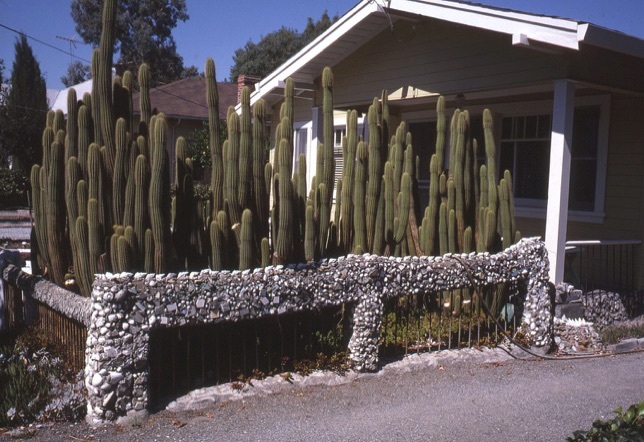 Capidro stared at the curbside with a “crushed white rock front lawn” including a cow skull and a cactus garden with 8-foot high plants surrounded by a modest cement fence. 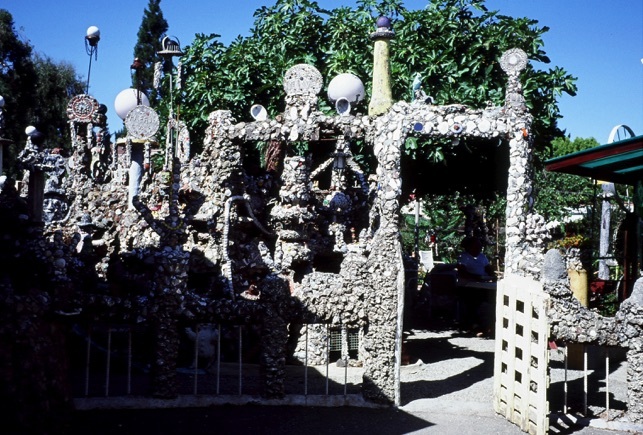 At the end of an open driveway was a gate that opened into Capidro the garden and the main attraction. 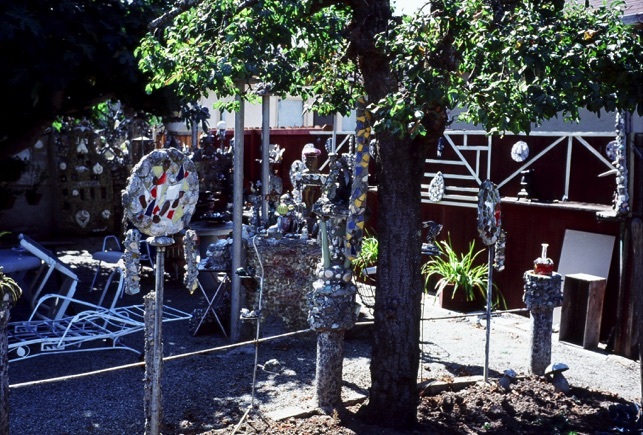 The garden was divided into many areas including a barbeque section, a wishing well, vegetable garden, reading area and covered patio. 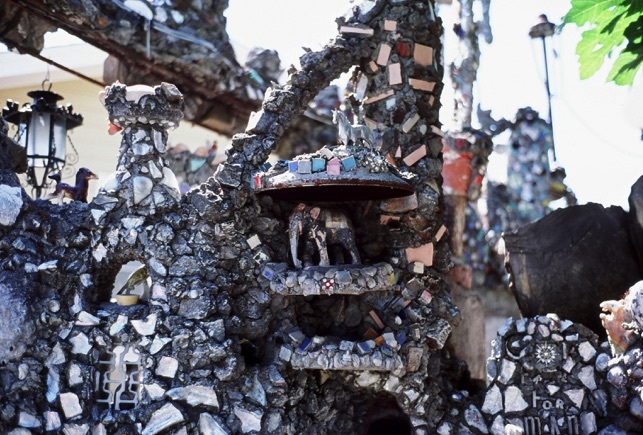 The entire construction looked quite otherworldly and not unlike an encrusted coral garden that had risen above the sea. 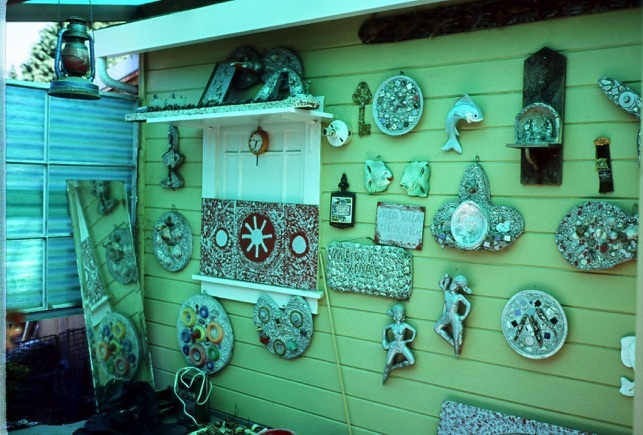 Areas of colorful tile and paint only occasionally broke the grey monotone color of the garden. Guidici installed an electrical lighting system throughout so as to illuminate the garden at night. 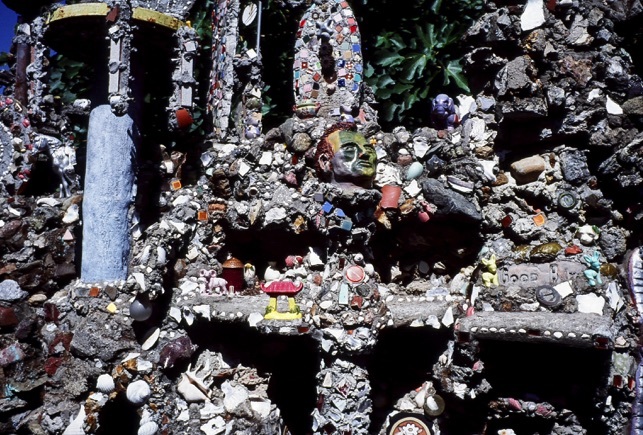 Interspersed also were various shrines and more personal spaces many of which had cryptic sayings in both Italian and English. Examples of which were, Don’t Die in Bed, Avanti (forward), Mama Pa Mi Aspeta (Mama Pa wait for me), Se Non Ti piache Non Guarda (If you don’t like it don’t look), (1937 Bon (Buon) Giorno (Good Day), Keep Off Kid, Good Come Again and For Man. The meanings of which will no doubt forever remain a mystery.